"I﻿﻿﻿﻿﻿﻿ took the time to research what you need to know about how to effectively use credit, charge & debit cards & how to read your credit report & score﻿﻿. With ﻿7 instructional lessons over 1.5 hours, I am confident you will ﻿feel ﻿﻿empowered ﻿to tackle this﻿﻿ life﻿﻿ skill"﻿﻿﻿﻿﻿﻿﻿﻿﻿﻿. Lesson﻿﻿ ﻿﻿1: What is credit? 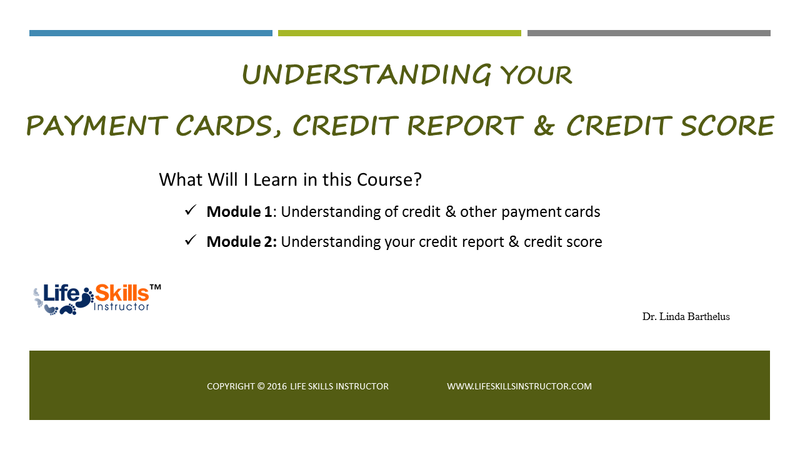 Lesson ﻿﻿﻿4: What is a credit report? This life skill is very necessary for your adult life because how you manage your credit affects your financial stability. This course will help understand the most effective way to use and protect your credit and help you face this life skill with confidence and avoid costly mistakes. There are alot of information online about credit, including credit report and score. This course takes provides the most relevant information you need to know as a young adult to confidently help you gain financial stability. Many young adults do not understand the first thing about credit...and reading their credit report is foreign to them. This course takes the fear and confusion on what a credit report is, where the information on the report comes from and how it is reported and more importantly how to improve your credit. Information reported on your credit report must be accurate because it has great impact on your creditworthiness. This course explains how to dispute the inaccurate information on this report. With solid knowledge on how credit works, how to effectively manage your payment cards & improve your creditworthiness... you will in a solid position to take advantage of all credit has to offer. If you get any lesson, watch the ones on what credit is, credit report and identity theft. The information was so to the point and you can tell the instructor knew what she was talking about. My problem is that I do not have any credit yet. Now I know what to do to get good credit and not a bad one.